GREAT FIND - THIS PROPERTY OFFERS LOTS OF ROAD FRONTAGE, LIGHTLY TREED EASY TO CLEAR, CLOSE TO SHOPPING, SCHOOLS, DOCTORS AND MORE. 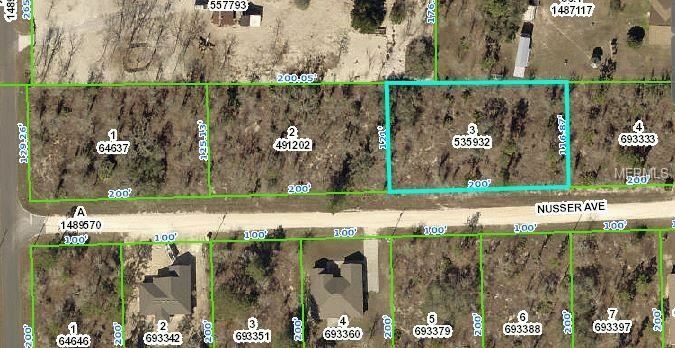 ONLY A FEW MINUTES DRIVE TO 597 SUN-COAST PARKWAY & TRAIL, 10 MINUTES TO DOWN TOWN BROOKSVILLE - NEED MORE THAT 1 LOT OR HAVE FRIENDS OR FAMILY THAT WANT TO BUILD NEAR YOU - LOTS 2 AND LOTS 3 ALSO FOR SALE. FROM HEXAM ROAD LOOK FOR FULMAR ROAD GO NORTH ON FULMAR ROAD TO LEFT TURN ON NUSSER AVE PROPERTIES ON RIGH. The approximate monthly Principal & Interest payment for this property would be $82. This payment is based on a 30-year loan at a fixed rate of 4.12 % with a down payment of $1,490. Actual lender interest rates and loan programs may vary.